The Easter long weekend has once again highlighted the adverse impact penalty rates are having on the hospitality sector, with the Courier-Mail reporting restaurants close over Easter as penalty rates see wages skyrocket. 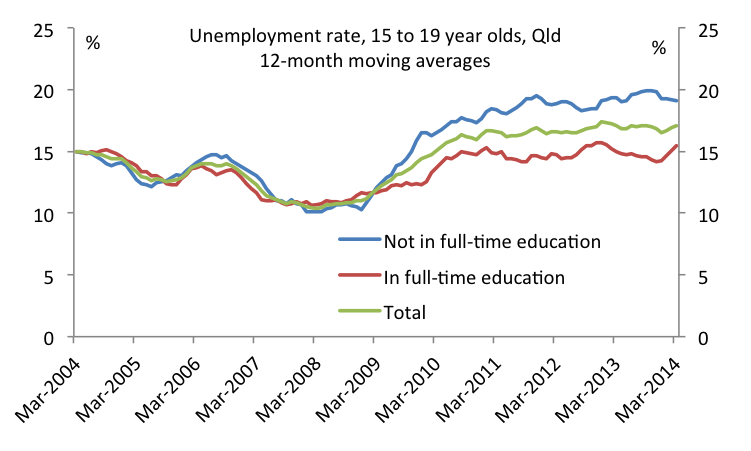 I’ve commented before on how penalty rates make it much more difficult for young people to get work and, given youth unemployment is re-emerging as an issue, particularly among those young people not studying (see chart below based on ABS data), it really is time to fix the problem. This entry was posted in Labour market, Tourism and tagged cafes, Easter, hospitality, penaltyrates, qld, queensland, restaurants, unemployment, youthunemployment. Bookmark the permalink.